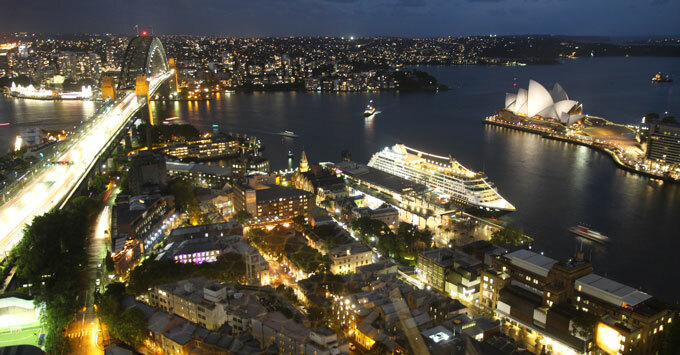 (2:10 p.m. AEST) -- The 680-passenger Azamara Journey has embarked on its 101-night cruise from Sydney to London, and we’re onboard for the first sector along the east coast of Australia. 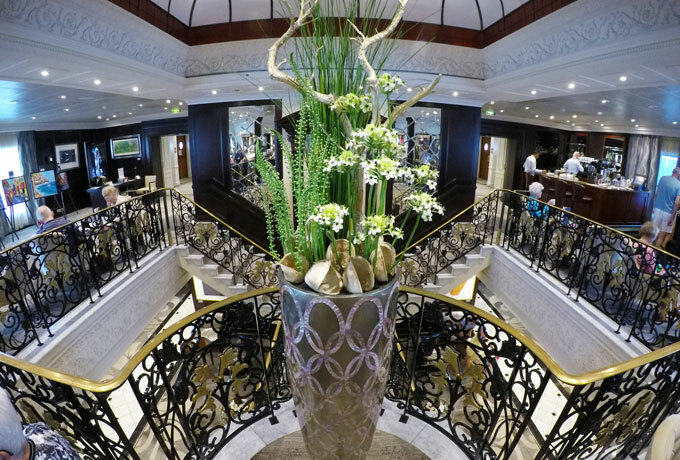 As Azamara Club Cruises’ inaugural world voyage, it’s a truly special experience. Having cruised on this refurbished ship last year, we have been yearning ever since to get back into the Azamara lifestyle. We were also intrigued to meet our fellow passengers, in particular the 46 people who will make Azamara Journey their floating home for more than three months, passing through 29 countries. 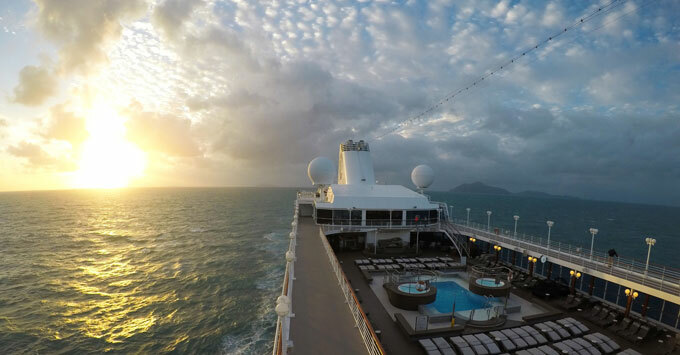 What makes Barry and Marcia’s story even more fascinating is that this is their first cruise. For others, like New Zealanders John and Bev, the itinerary appealed because it retraces the route they took some 40 years ago and happens to coincide with their golden wedding anniversary. The overwhelming reason, however, is the same simple answer: “Why not.” Over and over we heard the common phrase and modern acronym “YOLO” (you only live once). 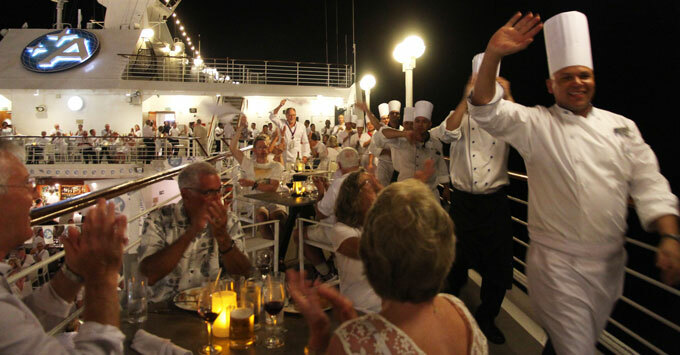 The question of why they chose Azamara to complete this lifelong dream was answered almost identically by everyone and came down to three driving forces: longer stays in port, intimate small ship cruising, and Azamara’s renowned service in an informal atmosphere. Also, many other lines’ world cruises spend countless days at sea and miss several ports of call along the way. Azamara's itinerary features 61 ports, which means passengers spend more days on land than on board. 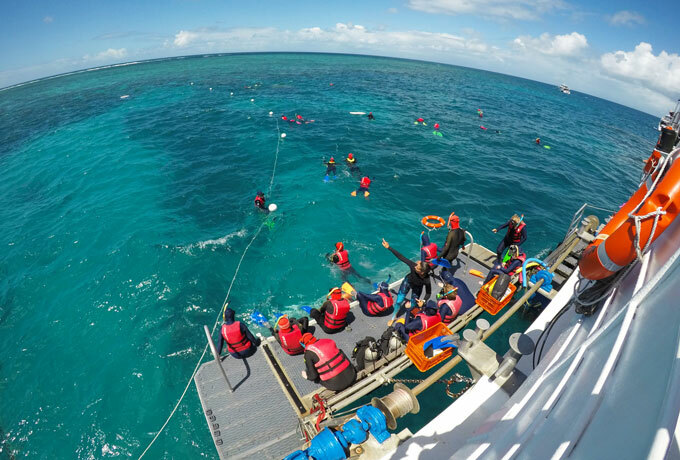 World cruisers face the enviable problem of how to pack for such a long cruise through so many different climates and cultures and doing so many different activities. It seems that each passenger’s packing methodology varied as much as their reasons to cruise. Some constructed a spreadsheet of interchangeable and easily washable clothing with the goal of cramming it all into a single suitcase. Others thought ‘what the heck’ and packed their entire wardrobe into seven pieces of luggage. With casual attire perfectly acceptable anywhere on the ship at any time of the day, passengers don’t have to pack a variety of suits or ballgowns. Embracing this homely approach, our new friend John was spotted at breakfast one morning wearing his Azamara-branded slippers. This did give us a laugh, but the ship really does become their home and the attentive crew do everything they can to encourage it. Famous for its late evening departures and overnight stays, Azamara allows its passengers to immerse themselves into the culture, arts, history or culinary flavours of each destination. The line’s enrichment program also offers so much diversity that often there are more activities planned on a port day than on a sea day. For the intrepid traveller with a lust for adventure, the ship carries a fleet of 16 lightweight bikes that anyone can take ashore to explore local villages and cities with a local guide. 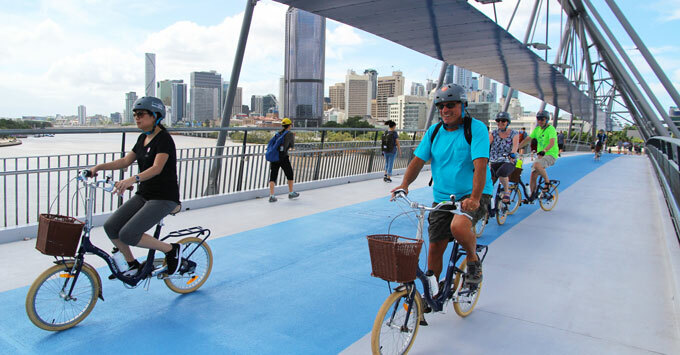 We jumped on the ‘Azalocal Bike’ shore excursion in Brisbane and thoroughly enjoyed cycling along the river bank and through the city with a dozen mostly foreign passengers. Imagine how amazing the same experience would be further along in this world voyage at any one of the Mediterranean ports, for instance. 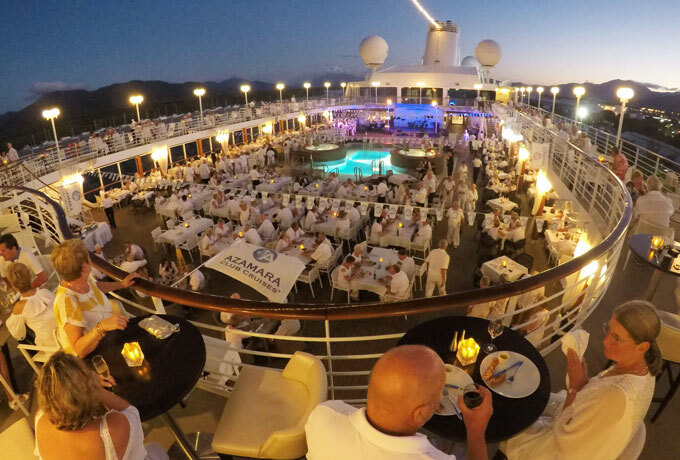 On one night per voyage, usually in the most exotic location, Azamara hosts an ‘Azamazing Evening’. The idea is to provide a private event that epitomises the culture or beauty of the destination. On this sector, it's a traditional Balinese dancing performance in the Denpasar Culture and Arts Centre in Bali. Experienced cruisers will know very well the angst of continually lining up at a bar to order a drink or the dreaded tendering operation ashore that so often ends up in a shambles. Well, not on a boutique ship of only 30,000 tonnes with fewer than 700 passengers. Firstly, we never have to approach a bar, as roaming drink waiters seemingly appear from nowhere and not only remember your name but are already holding your favourite beverage before you even know you want one. 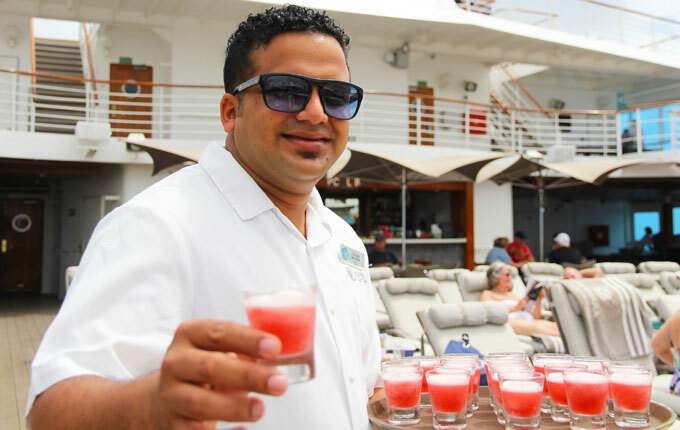 (Most drinks are included in Azamara’s fares.) As for the times we need to tender ashore, all passengers can be shuttled dockside in just four boats. Finding a comfy deck chair poolside is also never a problem, and sun worshippers will absolutely love the sun deck, which you often have exclusively to yourself. 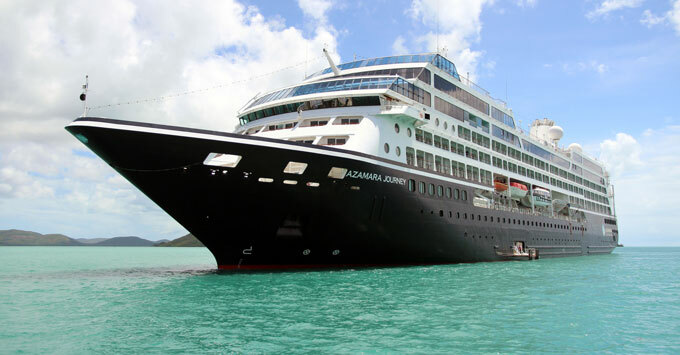 Marketed as a boutique hotel at sea, Azamara Journey is exactly that. 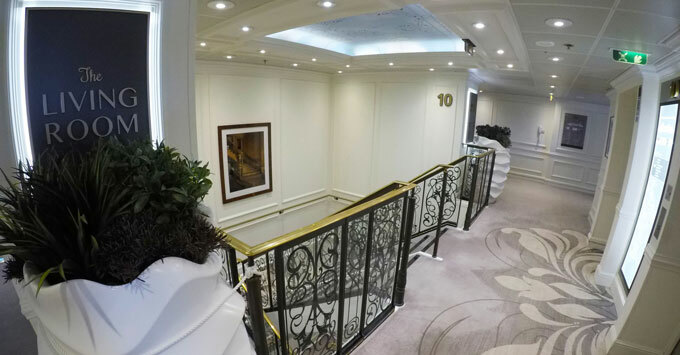 Warm tones and plush seating throughout the elegant lobby greet you upon boarding, with only a short stroll to your cabin (although this stroll seemed to take longer as the cruise progressed for all the chat stops along the way with our growing list of new cruise buddies). Many inviting of spaces are situated on Deck 10 with commanding views over the bow and either side through floor to ceiling windows. ‘The Living Room’ is a popular place, with the addition of a bar, evening tapas and sometimes the soothing sounds of a solo guitarist. This space is also used for the morning stretch and Pilates class hosted by a personal trainer. As well as the extremely social main dining room, Discoveries, the ship has two specialty restaurants: Prime C steakhouse, which serves the juiciest filet mignon, and Aqualina, offering delicious Italian. If you feel like a casual poolside burger or chargrilled brochette with salad, The Patio is open for a late lunch and dinner. 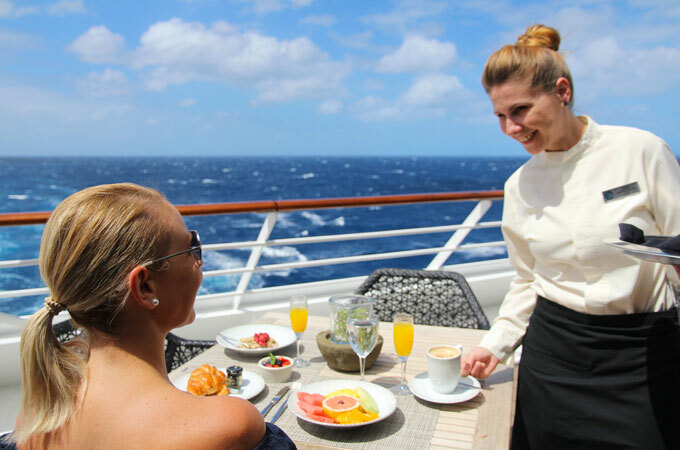 For an alfresco breakfast, the buffet-style Windows Café overlooks the mesmerising churn of the ship’s wake off the stern. Equally spectacular views can be seen from the plentiful tables indoors in this suitably named venue, where you will never be without a seat nor fighting hungry crowds. Open all day and with friendly table service, you would be very well served eating every meal in this fabulous restaurant. Dinners in Discoveries have proved to be something that we look forward to most nights. Starting off with a table for two, this soon ended up with four and then six diners as we were welcomed so warmly by other people. Food quality was superb (superior to some more upmarket cruise lines we’ve experienced) and for a world cruiser who could possibly dine here for 101 evenings, the cuisine is not too rich or over the top. 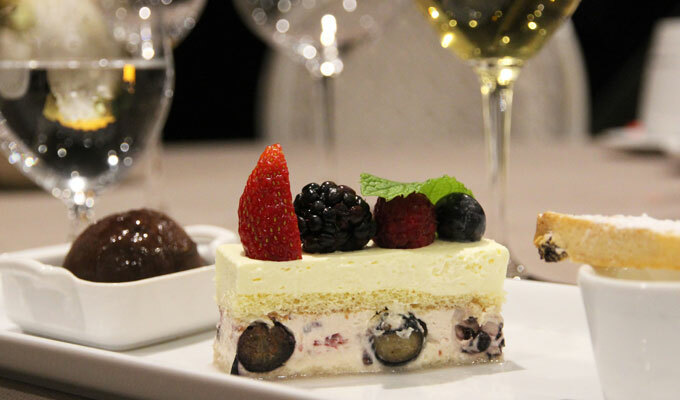 Instead the chef has created a menu around simple but well cooked dishes geared towards quality produce and perfectly seasoned sauces, followed by exquisite but sensibly sized desserts. Our circumstance on this cruise was unique in that we sailed courtesy of the cruise line and were often working alongside the 400 crew, shooting images for Azamara. Even in our short 12 days, we made many friendships with both passengers and crew. This was not uncommon, as everyone was establishing equally strong bonds with their favourite waiter, stateroom attendant, senior officers, the cruise director and hotel director. 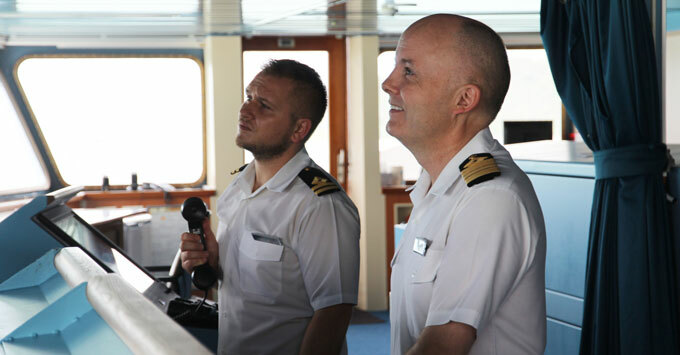 This seemingly effortless ‘nothing is a problem’ attitude starts from the top and in command of Azamara Journey for the entire World Voyage is the equally visible Captain Johannes Tysee (pictured below on the right), who you will often find sharing a morning coffee with passengers in the Mosaic Cafe. The relaxed vibe onboard is, of course, only permissible when you have a high crew to passenger ratio allowing more interaction and less work-related stress. In cruise circles the common phrase is ‘happy crew, happy ship’. We disembarked in Darwin, just missing the devastating Cyclone Marcus by one day. Watching the ship sail off into the Northern Territory sunset, heading for Bali (port number 7 out of 61) was rather emotional as we can only imagine the incredible adventures to come in the next 90 days. Azamara Journey’s 2018 World Journey started in Sydney on March 7 and finishes in London on June 17.